Just a day after developers were supplied with a second pre-release beta of iOS 11.2, Apple issued a new build for public testers as well, but with one small surprise: Apple Pay Cash is now available to try ahead of its public launch. Apple appears to have remotely enabled Apple Pay Cash for iOS 11.2 testers, meaning developers running the build from Monday should also have access to the feature soon. 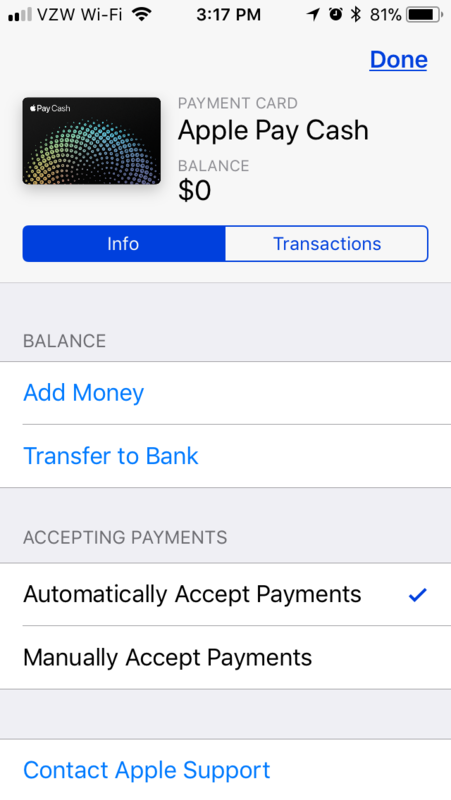 Available to beta participants based within the United States only, the payment system allows users to send cash to other users via a dedicated Apple Pay app within Messages in iOS 11. Funds are transferred to a prepaid "Apple Pay Cash" card, powered by partner Green Dot, which can then be used as a payment source for further Apple Pay transactions. The person-to-person payments are funded using existing credit and debit cards already added to Apple Pay, with transactions involving credit cards incurring a small fee while debit cards will not. Funds added to a user's Apple Pay Cash card can only be used for Apple Pay purchases in stores, online, and in apps, but cannot be transferred into a user's bank account. Apple originally introduced Apple Pay Cash as a feature of iOS 11 that would be added after the initial launch, in a similar way to how Apple Pay was introduced to users. Considering its appearance in the public beta of iOS 11.2, it is highly likely to launch when the iOS update ships in the near future. Other changes in iOS 11.2 include a Now Playing widget for Apple TV media in Control Center. It also adds SiriKit commands for HomePod, and rectifies a minor Calculator bug. iOS 11.2 beta 2 is identified as build 15C5097d. Damn i was hoping this would replace my Square Cash App me and my friend use it to pay each other back. Apple Pay adoption has been sluggish in certain areas like utilities so I wouldn’t wanna be paid this way. Do you think we’ll be seeing Pay gift cards in stores soon? That's an interesting question. If Apple gets a cut and it can be used at millions of locations from 10s of thousands of companies then it seems like an easy way for Apple to both capitalize on card services where they currently get nothing and increase ecosystem lock-in. Me too. This defeats the purpose of a person to person payment method. Would love to see something work as simply as Chase's Quick Pay with those who aren't Chase customers. I could be mistaken but I thought I read after the Apple Pay Cash announcement that funds could be transferred into a bank account. Is this a change? Or maybe that was just speculation. That does sort of limit its usefulness. We have somebody who does periodic work for us and only wants cash. She was looking forward to Apple Pay Cash but has yet to actually even use Apple Pay. Without being able to transfer that money to a bank account I imagine she won’t be interested. I just activated Apple Pay Cash; there’s an option for you to transfer to your bank. All set up to transfer incoming funds to my bank. If we do, will they be able to sell them at a discount, like they sometimes do with iTunes credit? Because, if so, then they won't let you add that to your bank account. Or, more accurately, if they do sell Apple Pay gift cards, I'm guessing something will stop them selling at a discount. I'll be interested to see when this is expanded outside the US. Especially here, where the Big 3 banks are still dragging their feet. I presume you’re in Australia. I can’t wait for ApplePay Cash here either. Some customers of the big 3 have been unwilling to get an account with ANZ/ING/HSBC, etc... but I think many of them will get an ApplePay Cash card and once they do, an see how convenient ApplePay is, I think they’ll finally switch banks and tech those big 3 a lesson about not giving customers what they want. Thanks for that. The big question for me is.. can you transfer money from your bank account to (the private and secure) Apple Pay Cash? Thanks for that. The big question for me is.. can you transfer money from your bank account to (the private and secure) Apple Pay Cast? Yes, if you use a debit card supplied by your bank, you can use it to top up your Apple Pay Cash “card”. That’s a mis-quote, funds are available to transfer to your bank account. There’s just a short delay. I still find people who are ANZ customers who haven't realised how easy it is to set up and use ApplePay. Hopefully ApplePay Cash will arrive soon and also with Woolworths starting to promote ApplePay at the moment it might start to see more adoption. Pretty much DOA as it won’t work with transfers to non Apple phones. Why would you buy stuff with it when you can use a rewards card? Pretty much DOA as it won’t work with transfers to non Apple phones. I think there’s probably enough millions of people using iOS devices to prevent it being completely doa. Its not just about buying things. Sending person to person payments without incurring the big fee PayPal charges me for receiving money is enough to ensure I’ll be using it and I’ll make sure any iOS device owning people who want to send me money do so too. Is that even possible with the security setup they have for their messaging protocol? One side is going to have to give in at some point. I think it will be the banks, rather than Apple. Especially as more financial institutions sign on as is, and now Woolworths Everyday Rewards has Apple Pay integration. I think the banks are running out of arguments. After all, the competition argument doesn't really hold water.